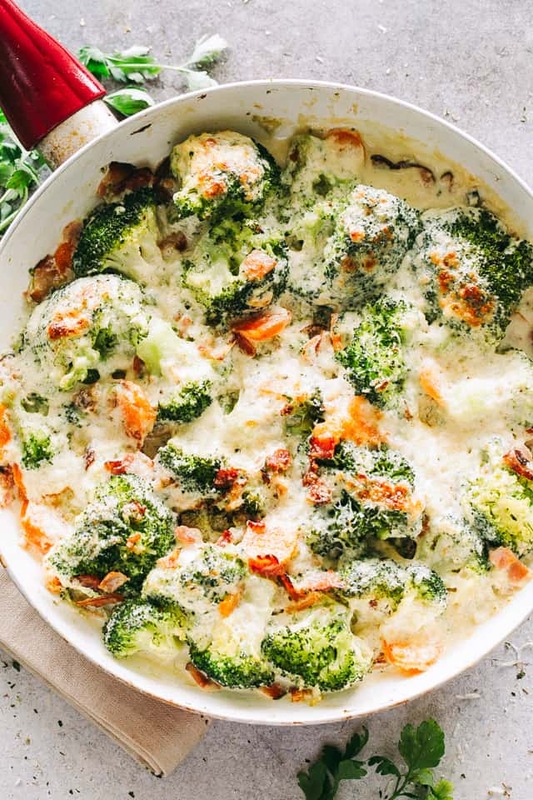 Creamy Broccoli and Cheese with Bacon – Cheesy broccoli and crispy bacon baked in a creamy, deliciously flavorful cheese sauce! 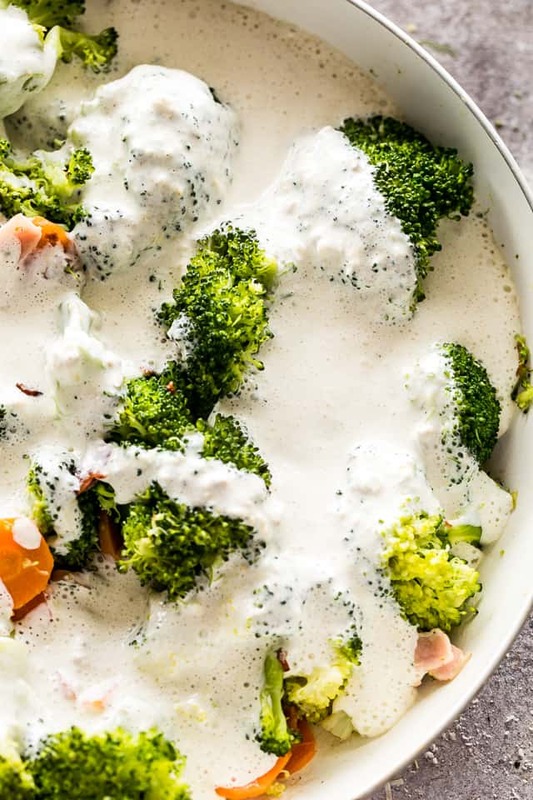 Topping steamed broccoli and carrots with a creamy cheese sauce is a sure fire way to make those picky eaters love their veggies! A few simple ingredients is all you will need to make this perfect, delicious, easy to make broccoli side dish. This recipe was originally published on August 13, 2014, and updated with new photos and content on May 19, 2018. Guys and Gals, can we just talk about this weather here? It’s like October-in-August around these parts. It’s raining, it’s cold, and we’re pretty much stuck inside, singing our lungs out to Katy Perry, and cooking broccoli. Cookies, too. It’s just how we roll. I’m also thinking about that back-to-school thing that’s kinda freakin’ me OUT! Ana starts kindergarten in one week. KINDERGARTEN! The lil’ girl, the one that barely weighed 6-pounds when she was born, is about to take off and start her school-journey. FUH-reakin’ OUT! Not sure how all this happened. I’m only 23! Don’t worry about what my driver’s license says, m’kay? In my mind, I’m 23. 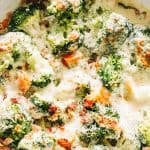 In honor of back-to-school, I made you this Creamy Broccoli and Cheese with Bacon side dish, a very close cousin to my Creamy Cheesy Brussels Sprouts with Bacon! I am forever in love with broccoli. With any and all vegetables, in fact. I like green, tree-ish lookin’ things. Not as much as cake, but I do love them enough to want to stuff my face with ’em. 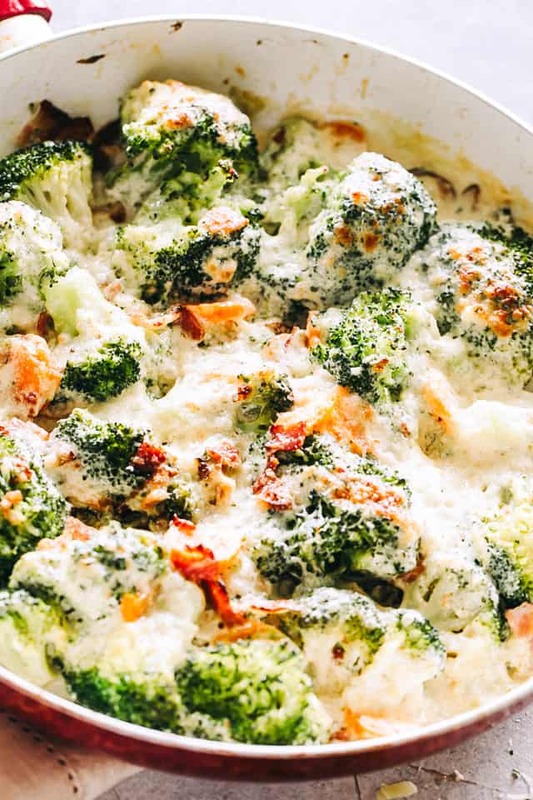 This AMAZING creamy broccoli side dish is sort of a healthful combination of broccoli florets, a bit of garlic, couple of carrots, and handfuls of cheese – because, let’s face it, even I can’t have veggies without cheese. It’s the natural thing to do. We will begin by boiling out broccoli and carrots for a bit, and then adding them to a skillet with crispy bacon. A creamy cheese sauce will also be added to the skillet. We then will transfer the skillet to a preheated oven and bake it for about 15-ish minutes, or until sauce is bubbly and top is browned. If you’re looking to make the best veggie side dish yet, give this a GO. I think you’ll like it. 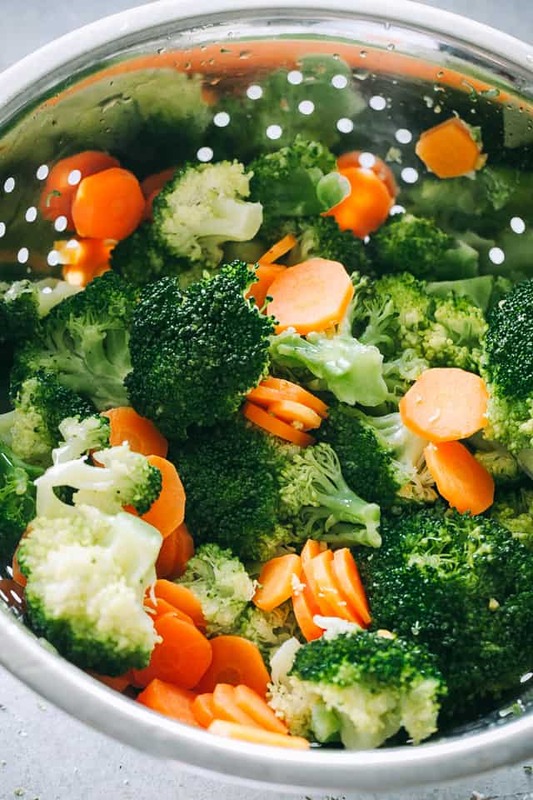 Place broccoli florets and carrots in a large saucepan with 1-inch water; bring to a boil and cover; continue to cook for 4 to 5 minutes, or until fork tender. Drain. Heat olive oil in a large oven-safe skillet; add bacon and cook for 3 minutes, or until crispy. Add broccoli and carrots to the skillet and continue to cook for 1 minute. In the meantime, prepare the sauce by combining half & half, dijon mustard, half of the parmesan cheese, garlic, salt, pepper, and nutmeg in a mixing bowl; mix until well combined. 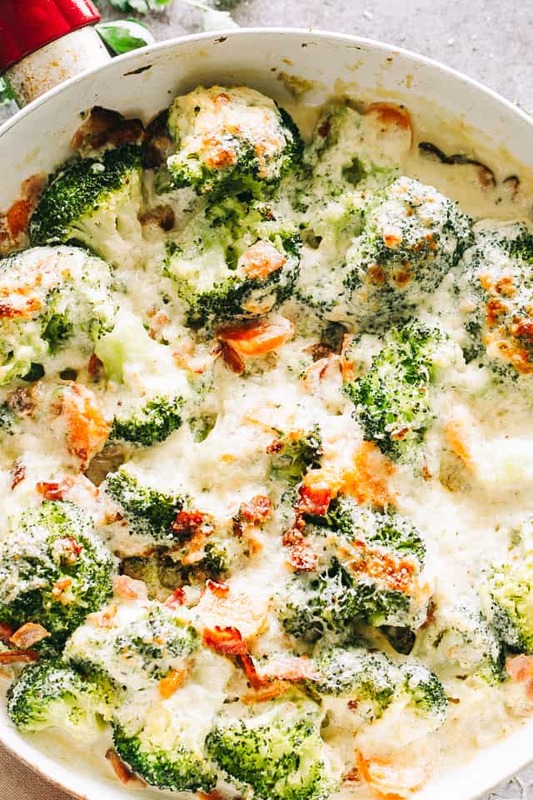 Pour prepared cream sauce over the broccoli and sprinkle with remaining parmesan cheese over the top. Bake for 15 to 20 minutes, or until bubbly and top is golden brown. Delicious looking veggie side dish. Do you know how many calories per serving this is? 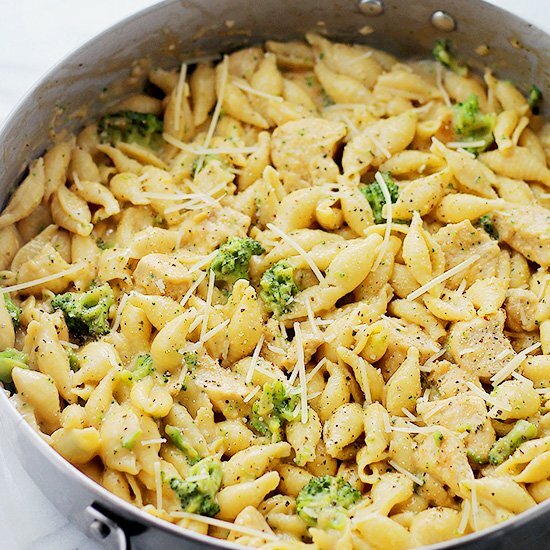 Since I love cheese and broccoli, this is pretty much a perfect recipe to me. 🙂 The pictures are great too, the meal looks really delicious. Can’t wait to get home and try it out myself. Do you have any other great recipes like this one? Hi Lucy! Thanks so much!! I could go for this recipe anytime!! Thanks for your comment. I have become recently obsessed with broccoli, so this is right up my alley right now. This looks amazing! Huuuge broccoli lovers over here but never think to make a casserole. YUM. Oh girl you definitely did broccoli right, so right in fact! I need this! For reals?!! Love me some casserole! It’s FINALLY October-in-August around here – except two days ago it was July-on-the-sun around here, so I’ gald for the cool relief. And I’m def all for cozy food right now! This looks great. 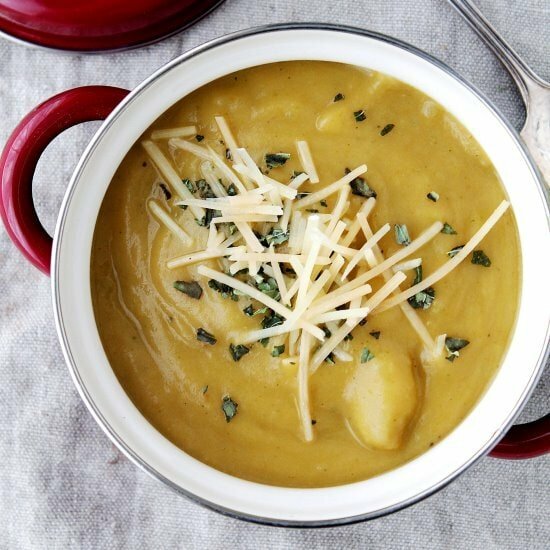 You just reminded me about my favorite Panera Bread soup, broccoli cheddar! However I love this combo!!! I love a good cheesy broccoli casserole. . yummm!!! and about your daughter starting school. . I feel you. . hang in there, bring some tissues but don’t let her see you cry. . is she excited about starting Kindergarten? She’s actually excited! Can’t wait to see how long that lasts… 😀 It wouldn’t be so bad if they didn’t have to go a full day. Up until two years ago, it was only half days for Kindergarten, and I can handle that. This full day thing is making me nervous. I’ll make sure to bring tissues! An all time favorite dish of mine, love everything about this one! Cheese with broccoli – always! Love this! Love this! 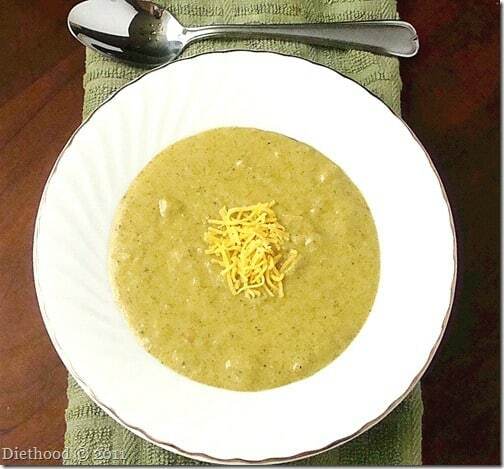 Broccoli is the only veggie all my kids will eat so I’m sure they’d thank you for this recipe! I love broccoli and bacon on a mozzarella cheese-covered crust! Solves the problem nicely, don’t you think? Cheese and broccoli is one of my favourite flavour combinations. Just noticed that you listed whipping cream in the ingredients list but then mentioned ‘milk’ in the instructions.